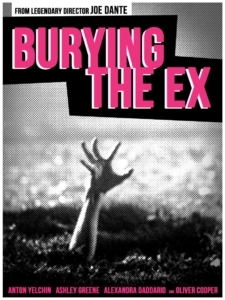 Burying the Ex is a 2015 horror comedy (zom-com) written by Alan Trezza, adapted from the 2008 short film of the same name, which was also written and directed by Trezza. The film is helmed by Joe Dante, the mastermind behind such classics as The Howling, Gremlins, Innerspace and Piranha (among many others). As a horror fan, it’s hard not to appreciate a film that shows such love and affection for the genre. The hero of the film, Max (played to perfection by Star Trek alum Anton Yelchin), is the frustrated boyfriend of the uptight and overbearing Evelyn (Twilight’s Ashley Green). He’s an employee of a horror-themed souvenir shop and dreams of owning his own macabre store one day. Evelyn is unsupportive. He collects rare vintage movie posters, and she destroys them. Her lack of respect for his obsessive love of the genre is a central problem in the couple’s struggling relationship. The couple has virtually nothing in common outside of sexual chemistry. But Max lacks the fortitude to end the toxic relationship. Under intense pressure, he even pledges they’ll be together forever. Unfortunately, he makes this half-hearted promise while in his store and in the presence of a devil doll with supernatural powers. Max finally gets up the courage to call it quits. But before he can pull the plug, Evelyn is hit and killed by a bus. As Max tries to move on and attempt a new romance with Olivia (Alexandra Daddario, True Detective), the adorable owner of a horror-themed ice cream shop who is perfect for him in every way, a zombified Evelyn comes back from the dead to seriously complicate matters. Beyond the script, genre fans will appreciate all the loving visual touches from Dante. Virtually every frame is filled with reverential references—from movie theater marquees to obscure film references, from Max’s macabre store to Olivia’s delightfully quirky ice cream shop, and even the classic movies playing on televisions in the background. Unlike other postmodern, self-aware horror films, the endless genre references don’t feel forced or a way to say, “Look how cool and hip we are.” Instead, they feel like a sincere reflection of Dante’s heart, which is hard not to find endearing. There’s not a lot in the way of actual gore or real horror, but it’s fun watching Evelyn deteriorate the longer she’s out of the ground. And the nastier she looks, the nastier she acts, ramping up to the highly enjoyable blood-drenched finale. Everyone in the tiny cast delivers stellar performances. Though made with a micro budget and shot in just 20 days, the film looks polished and reflects Dante’s directorial finesse. A true genre master, Dante is adeptly skilled at blending gory horror and dark comedy. 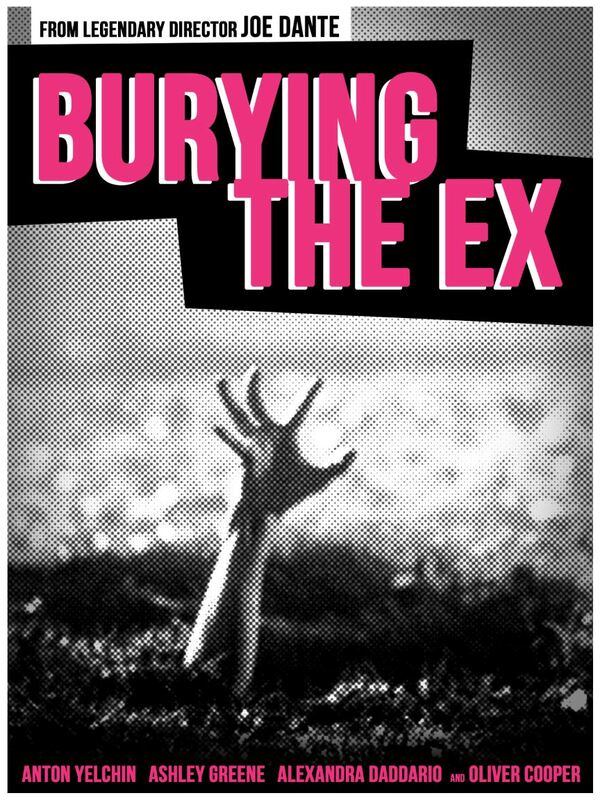 The appropriately disgusting FX gags in Burying the Ex coexist effortlessly with the light-hearted humor and romance. The film has not been well received by critics, and there are legitimate reasons for that. The concept, while cleverly executed, feels a bit tired on the heels of the recent zom-com craze. It’s a feature length film that feels like a great short film concept stretched a little too thin. The plot is threadbare with very little depth. While the film does attempt to address the timeless issues of control and jealousy and how much to compromise in a relationship before you start to lose yourself, this is all pretty surface level and told from a decidedly male perspective. This is a movie made BY fanboys FOR fanboys. That’s not necessarily a bad thing, but it won’t be for everyone. To be fair, Burying the Ex is nowhere near Dante’s best, but he’s an exceptionally skilled craftsman who still knows how to deliver the goods. And, in spite of its flaws, it’s a fun flick with a lot of charm that should appeal to genre fans and Dante enthusiasts. This clever zom-com directed by genre master Joe Dante plays like a love letter to the genre, and it’s hard not to truly appreciate the effort even if the execution is not perfect.